The cover of the latest issue of the Film Noir Foundation’s magazine says it all. The women of film noir, particularly the ones behind the scenes, step into the spotlight in this edition. 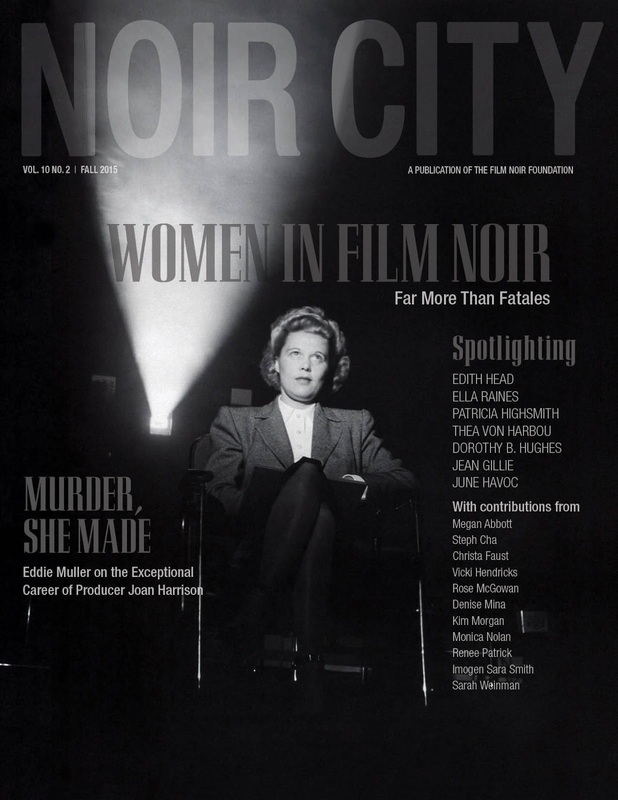 The result is, in the words of FNF founder and host of Turner Classic Movies’ Summer of Noir Eddie Muller, our “best issue ever.” It certainly boasts a stellar line-up of contributors. Kicking things off is the cover story by Eddie himself on Alfred Hitchcock’s secret weapon, producer Joan Harrison. We’ve got Kim Morgan offering her defense of the femme fatale, Christa Faust weighing in on every movie based on the infamous “Honeymoon Killers” case, plus actress/hellraising advocate Rose McGowan on her top five noir films. Not to mention surveys of the film adaptations of Dorothy B. Hughes and Patricia Highsmith; tributes to Ella Raines, June Havoc and Jean Gillie; and so much more. Getting her first-ever byline is Renee Patrick, the mystery writing alter ego I share with my wife Rosemarie. Together we look at Edith Head’s singular fashion contributions to film noir, in a piece gorgeously assembled by ace designer Michael Kronenberg. It was my distinct pleasure to organize the women noir writers’ roundtable, posing questions to a quintet of top-flight talents: Megan Abbott, Steph Cha, Christa Faust, Vicki Hendricks and Denise Mina. I also interview Sarah Weinman about the acclaimed new collection she edited, Women Crime Writers: Eight Suspense Novels of the 1940s and ‘50s. My Cocktails & Crime column is in the front of the book, while in the back is a piece I’ve wanted to write for a while: an appreciation of the Joel and Ethan Coen film The Man Who Wasn’t There. Its debut on Blu-Ray finally allows me to make the case for it as the Coens’ best film, a truly chilling film noir, and one of the few masterpieces of this still-young century. I’ll be blunt. You need this issue. So make a donation to the FNF’s preservation efforts and receive the magazine as your reward. The ladies of film noir and I thank you.